Basic Summary: A desperate man flees his crumbling home life for a job as a forest fire watchman, and bonds with his partner over the radio while uncovering sinister phenomena. THIS GAME IS SO GREAT. Okay. Got that out of my system before we start the critical analysis. 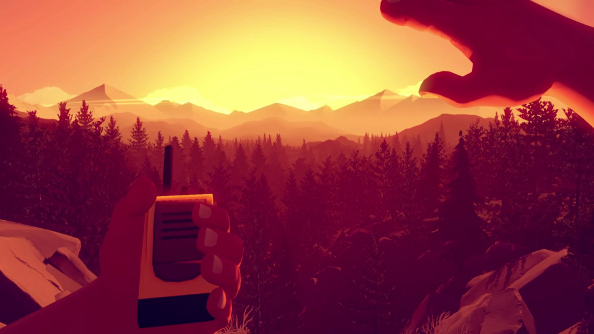 Yes, Firewatch is so far my absolute favorite game of 2016, narrowly beating out stunners like The Witness and SUPERHOT. Let’s explore why, and I’ll see if I can sell even the most ardent “THIS IS JUST A WALKING SIMULATOR NOT A REAL GAME” people on this. This being a story-based experience more than a gameplay one, we’ll start on the gameplay. When you think of a “walking simulator”, you probably think of the formula popularized by divisive indie hits like Dear Esther and Gone Home: walking slowly around an environment and clicking on things to hear parts of a narrative. 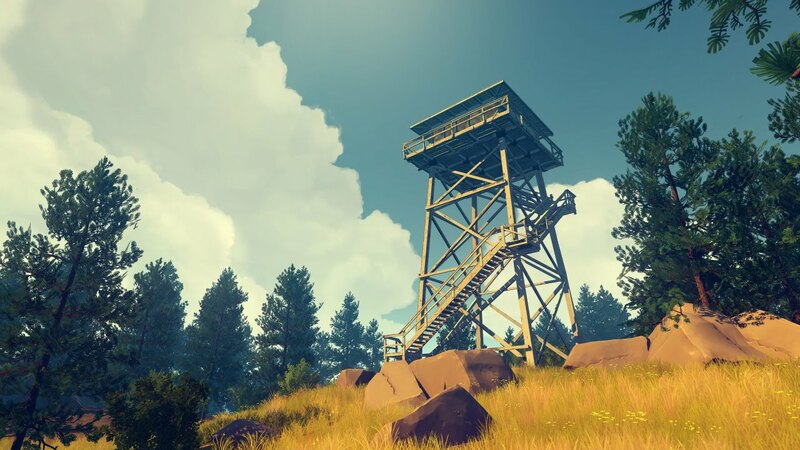 This formula has its draws and its downsides, but Firewatch takes a much more advanced approach to better blend the story and the game. The core mechanics of exploring an environment and interacting with things are woven into diverse environmental actions and varied objectives. Hiking, climbing, rappelling, and otherwise bumbling through the forest feels more satisfying from a gameplay standpoint than the genre’s typically slow, safe movement. And while there isn’t much in the way of a typical challenge, that doesn’t mean the forest is entirely safe or that nothing bad can happen to Henry should you stumble upon certain things. It’s all very active, is what I’m trying to say. You also have gear, including a flashlight, climbing ropes, a disposable camera, and of course, the radio with which you correspond with Delilah. 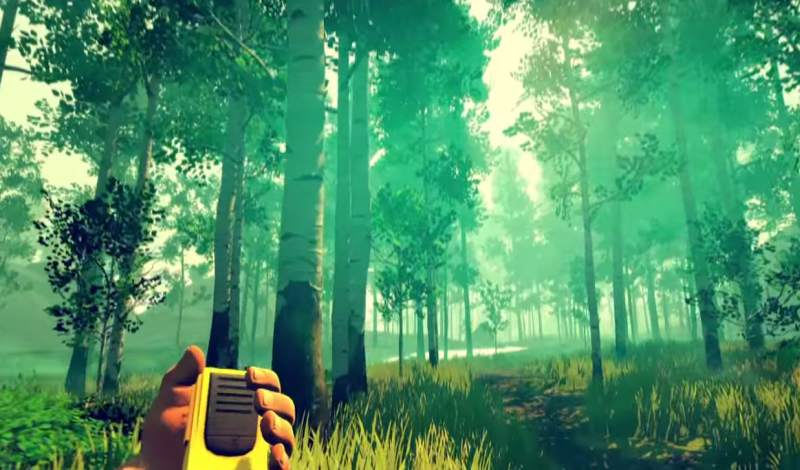 The radio conversations form the meat of the game and give you something to do while trekking across the vast expanse of lovingly rendered forest. Most of Henry’s responses are selectable a la Telltale’s games, and while a lot of the choices change only what kind of witty banter you’ll hear, an equal amount have effects to varying degrees later on, including impacting what Delilah thinks of Henry as a person. The graphics and sound design also deserve to be commented on before we sink our teeth into the story and characters. This game looks plainly beautiful, with its richly detailed, miles-long stretch of forest complemented by a cel-shaded art style reminiscent of a slightly more realistic Wind Waker. Henry’s character model fits the world without looking too cartoony to take seriously, and while the inability of the engine to handle proper faces becomes a bit of a drawback as the story starts resolving, I otherwise have no complaints about it. As for the sound design, the ambient noise of the forest is engrossing enough and the occasional peaceful musical sting is welcome, but it truly shines with pounding drumbeats and other chilling musical selections when situations are kicking into high gear and ominous happenings approach. All right, with that out of the way, time for the point of the game. This is a character-driven story, in which Henry, Delilah, the interactions between them, and the circumstances that unfold around them are the central focus. “Walking simulator” protagonists tend not to pack much in the way of character, as the usual approach is to make them ciphers for the player to unravel the story of other, more interesting individuals. This is not the approach taken with Henry, who lingers in my mind as one of the most interesting and well-developed protagonists in recent games of any genre. The prologue goes to traumatizing lengths to get you into his head (and heart) before Rich Sommer even speaks a word of his masterfully delivered dialogue. While Henry has a distinct, realistically layered personality, his actions and reactions in both stressful and lighthearted situations are wholly up to you. He is a rare kind of character that has a distinct, voiced, and fully fleshed-out identity, while also serving flawlessly as a role that players can slip into and associate with themselves. Delilah, the voice broadcasting to your radio from a tantalizingly distant tower, is equally superb. While not immediately the most likable person, in short time I had completely warmed up to her. She’s witty, intelligent, and occasionally too forward for her own good, and she feels like a person. I had no trouble growing attached to her, and I found myself going out of my way to have Henry treat her affectionately. Meeting her and coming to understand her feels more like meeting and bonding with a lifelong friend than a lot of games with similar focus accomplish. And on that note, even though Firewatch can be completed in about 3-5 hours depending on whether or not you’re just beelining to your objectives, I felt like I’d spent a lifetime with these two. Henry and Delilah are, at the root of it, real people. Their exchanges are pin-sharp when they need to be funny and downhearted on serious subjects, and they almost never feel awkward or recited. Their relationship, whether you want it to be a friendship or a budding romance, is a relationship between two people with comparable and contrasting traits, flaws, and personal baggage. It’s breathtaking, and it easily earns its spot high among iconic gaming bonds like Bioshock Infinite’s Booker and Elizabeth or Life Is Strange’s Max and Chloe (or my lesser-known but equally engrossing darling duo, SOMA’s Simon and Catherine). So the central character dynamic is great, but does the plot driving them forward hold up? It certainly starts strong with the impressively downbeat prologue and an entertaining mission to stop drunk teenagers with fireworks from burning half the forest down. The months-long montage toward the game’s middle is another high point, throwing Henry, Delilah, and the player through snapshots of emotional beats and amusing situations. Suspicious goings-on are dripped in through all of this, but they only take center stage in the third act. These final days turn the suspense up to eleven and pound out cryptic threat after cryptic threat, the shape of which I won’t spoil but which continues to become more and more imposing as time winds down. However, the final revelations and resolution to the conflict have proven incredibly divisive among players and critics, for entirely understandable reasons. Some feel that the answers are a perfect reflection on the game’s themes and the realistic nature of the story beforehand, while others are profoundly disappointed from a raw storytelling standpoint, enough that it knocks their opinions of the game down a few notches. Both are equally valid and there are sound arguments to justify either side. As of this writing, it’s been almost two months since I first reached the end, and in the ensuing time and across multiple viewings of other peoples’ playthroughs, I still don’t entirely know my opinion. To me, it is the perfect resolution, one that makes complete internal sense and contributes to what the game has truly set out to be, and yet I feel rather let down all the same. You will all come out with differing opinions, I’m sure, but I recommend that everyone who plays it sits down and simmers on it for some time before jumping to one judgment or another. After you’ve gotten your answers, though, the last few minutes rise back to near-perfection. The conclusion to the dynamic between Henry and Delilah takes center stage one last time in a conclusion that, while influenced by her attitude toward you among other factors, is bittersweet no matter how you slice it. It’s the kind of ending that, if you’ve formed any connection to the game and its stars, will leave you thinking for a while about what might happen next or whether something could have been done to help things turn out differently. 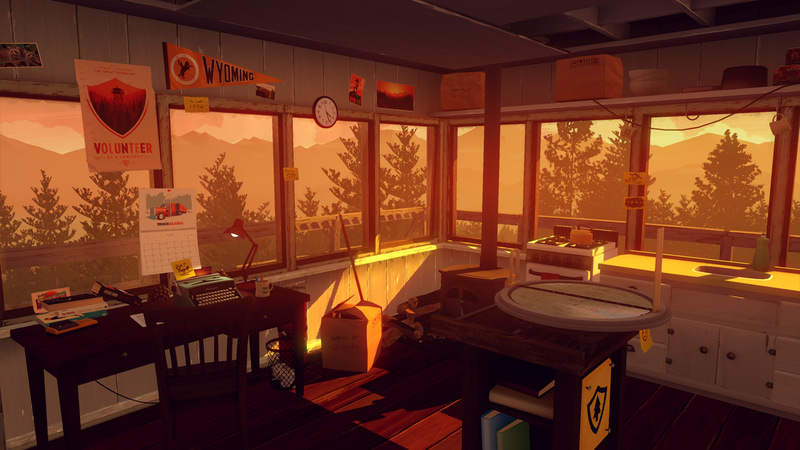 When the time came to step away from Firewatch, despite my misgivings about the answers I was given, I was depressed. As I said, it felt like leaving behind characters I’d known and come to care about for a lifetime; I wanted nothing more than to have a few more hours with them. Taking this journey is a beautiful experience in many respects, and it won’t be one you’re likely to forget no matter what your opinion at the end is. It isn’t your typical “walking simulator”, and I hope I’ve motivated anyone who may have shunned it at launch for bearing that stigma into giving it a fair shake. Sorry. I don't play kiddy cartoon games. 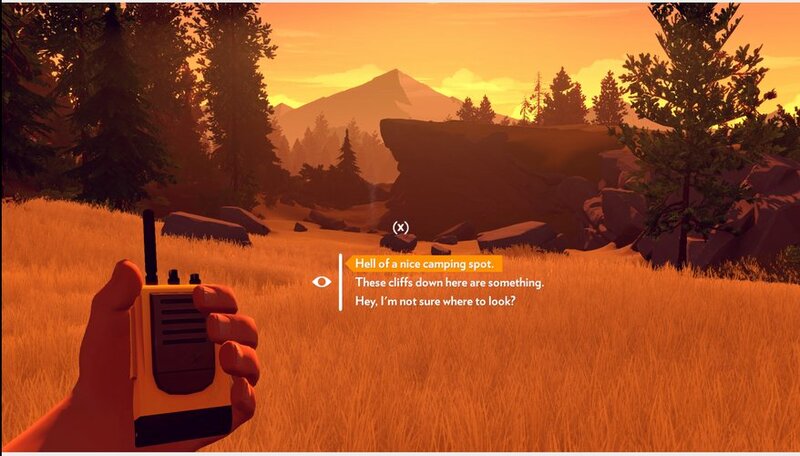 I thought FireWatch was a fire simulator where you watched fire do it's thing on different things. I have this on my wishlist! Great review, thank you for sharing your thoughts.